Tennis elbow is an injury to the muscles and tendons on the outside (lateral aspect) of the elbow that results from overuse or repetitive stress. 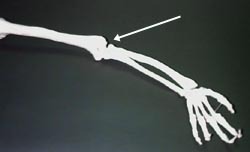 The narrowing of the muscle bellies of the forearm as they merge into the tendons create highly focused stress where they insert into the bone of the elbow. (1) A one-handed backhand with poor technique (the ball is hit with the front of the shoulder up and power generated from the forearm muscles). (2) A late forehand swing preparation with resulting wrist snap to bring the racquet head perpendicular to the ball. (3) While serving, the ball is hit with full power and speed with wrist pronation (palm turned downward) and wrist snap which increases the stress on the already taught extensor tendons. Medial epicondylitis is less common and characteristically occurs with wrist flexor activity and pronation. Medial epicondylitis can result from:(1) Late forehand biomechanics where the player quickly snaps the wrist to bring the racquet head forward. (2) The back-scratch or cocking phase when serving, which places tremendous stress on the medial tissues of the elbow. (4) Improper pulling technique with certain swim strokes, especially the backstroke (also referred to as "swimmers elbow"). 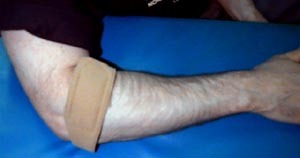 It should be kept in mind that elbow epicondylitis is not limited to those persons playing tennis, golf, baseball or swimming and can result from any activity that puts the lateral or medial compartments of the elbow under similar repetitive stress and strain (e.g., hammering, turning a key, screw driver use, computer work, excessive hand shaking). Epicondylitis, both medial and lateral, is a common and often lingering pathologic condition. It is critical, therefore, that you progress your rehabilitation only when you experience minimal or no pain. For more on when and how to progress, see below. As a general guideline, the more chronic or longer you have experienced the condition, the longer the recovery time is to be expected (up to 8 weeks). Rehabilitation - What should I do, when should I do it, and how? Epicondylitis often becomes a chronic problem if not cared for properly. For this reason, it must be stressed that the rehabilitation process should not be progressed until you experience little or no pain at the level you are performing. Regaining full strength and flexibility is critical before returning to your previous level of sports activity. Rest - this means avoiding further overuse not absence of activity. You should maintain as high an activity level as possible while avoiding activities that aggravate the injury. Absolute rest should be avoided as it encourages muscle atrophy, deconditions tissue, and decreases blood supply to the area, all of which is detrimental to the healing process. Pain is the best guide to determine the appropriate type and level of activity. Ice - is recommended as long as inflammation is present. This may mean throughout the entire rehabilitation process and return to sports. Ice decreases the inflammatory process slows local metabolism and helps relieve pain and muscle spasm. Compress and Elevate if appropriate to assist venous return and minimize swelling. Goals: Improve flexibility, increase strength and endurance, increase functional activities and return to function. Gentle stretching exercises including wrist flexion, extension and rotation. 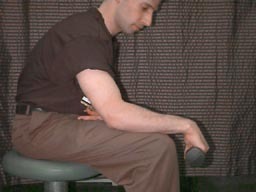 The elbow should be extended and not flexed to increase the amount of stretch as required. These stretches should be held for 20-30 seconds and repeated 5-10 times, at least twice a day. Vigorous stretching should be avoided - do not stretch to the point of pain that reproduces your symptoms. Wrist Extension. Place 1 lb. weight in hand with palm facing downward (pronated); support forearm at the edge of a table or on your knee so that only your hand can move. Raise wrist/hand up slowly (concentric contraction), and lower slowly (eccentric contraction). Wrist Flexion. Place 1 lb. weight in hand with palm facing upward (supinated); support forearm at the edge of a table or on your knee so that only your hand can move. 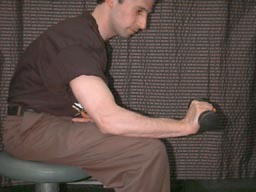 Bend wrist up slowly (concentric), and then lower slowly (eccentric)(similar to exercise above). Combined Flexion/Extension. Attach one end of a string to a cut broom stick or similar device, attach the other end to a weight. In standing, extend your arms and elbows straight out in front of you. Roll the weight up from the ground by turning the wrists. Flexors are worked with the palms facing upward. 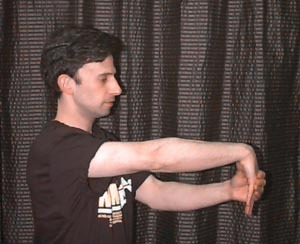 Extensors are worked with the palms facing downward. Forearm Pronation/Supination. 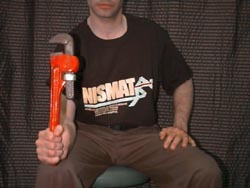 Grasp hammer (wrench, or some similar device) in hand with forearm supported. Rotate hand to palm down position, return to start position (hammer perpendicular to floor), rotate to palm up position, repeat. 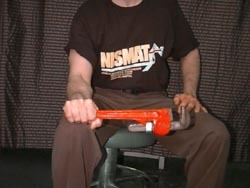 To increase or decrease resistance, by move hand farther away or closer towards the head of the hammer. Finger Extension. 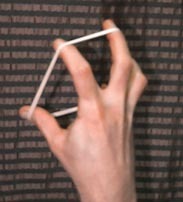 Place a rubber band around all five finger tips. Spread fingers 25 times, repeat 3 times. If resistance is not enough, add a second rubber band or use a rubber band of greater thickness which will provide more resistance. Ball Squeeze. 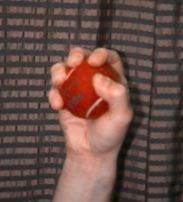 Place rubber ball or tennis ball in palm of hand, squeeze 25 times, repeat 3 times. If pain is reproduced squeeze a folded sponge or piece of foam. For all of the exercises (except combined flexion\extension) perform 10 repetitions 3-5 times a day. With the combined flexion/extension perform until you feel fatigue. With all exercises use pain as your guide - all exercises should be pain free. When to progress. Begin with a 1 lb. weight and perform 3 sets of 10 repetitions. When this becomes easy, work up to 15 repetitions. Increase the weight only when you can complete 15 repetitions 3 times without difficulty. The axiom "No Pain No Gain" does NOT apply here. After exercising, massage across the area of tenderness with an ice cube for about 5 minutes. You might also try filling a paper cup half-full with water and freeze; peel back a portion of the paper cup to expose the ice. Goals: Improve muscular strength and endurance, maintain and improve flexibility, and gradually return to prior level of sport or high level activity. Continue the stretching and strengthening exercises emphasizing the eccentric contractions of wrist flexion and extension. In this regard, since the eccentric contractions are movements with gravity, do not let the weight drop too quickly; lower the weight in a controlled fashion. With the combined wrist flexion/extension exercise, work on increasing speed when rolling up the string with the attached weight as this will improve endurance. Lateral counter-force bracing is believed to reduce the magnitude of muscle contraction which in turn reduces the degree of muscle tension in the region of muscular attachment. The counter-force brace is essentially an inelastic cuff that is worn around the proximal (near) forearm (against the forearm extensors for lateral epicondylitis and around the forearm flexors for medial epicondylitis). In theory, the brace constrains full muscle expansion when the muscle contracts, diminishes muscle activity, and therefore the force generated by the muscle. An analogy is the fret on a guitar; when you exert pressure on a different fret along the neck of the guitar, it changes and reduces the tension on the guitar string above where the pressure is exerted. The counter-force brace can be worn beginning in Phase 2 of your rehabilitation program. However, adhere to the following caution: do not become dependent on the counter-force brace and gradually wean yourself off its use during Phase 3. Counter-force bracing is a supplement to, not a replacement for your rehabilitation program. Using the wrong tennis racquet may have been a contributing factor to your injury. Guidelines for racquet selection for non-tournament players are provided below. Racquet material - Graphite composites are currently considered the best in terms of torsion and vibration control. Head size - A midsize racquet (95-110 square inches) is preferred. The popular oversized racquets cause problems because they make the arm susceptible to injury due to the increased torque effect of shots hit off-center. String tension - stay at the lower end of the manufacturer's recommendation. While higher string tensions provide improved ball control, it also increases the torque and vibration experienced by the arm. Stringing material - synthetic nylon (re-string every 6 months). 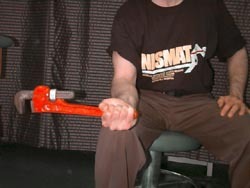 Grip size - A grip too large or too small lessens control and promotes excessive wrist movement. 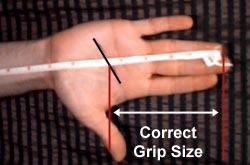 To measure an appropriate grip size for your hand see image below. You can find more articles like this to help your tennis game by going to http://www.nismat.org . Copyright © 1996-2002 The Nicholas Institute of Sports Medicine and Athletic Trauma, unless otherwise noted. All rights reserved.